Whenever we have big news, we’ll post the latest in news releases, advisories and multimedia resources on this page. We know as a reporter or blogger you have a lot on your plate, so we make it simple – start with us and we’ll help you on your way to sharing news about Huntsville, Alabama. You can also follow our blog – iHeartHsv.com– for new content and fresh perspectives on Huntsville and surrounding areas from local guest bloggers. Have a question not covered here? Get in touch. You may have noticed a blitz on your website recently. That’s because the phenomenal people of Huntsville, AL, want you to hear loud and clear how passionate we are about bringing Trader Joe’s here. Here’s a few reasons why your next home should be in the Rocket City. Huntsville is one of America’s best kept secrets - although the word has been getting out lately. It’s probably because we’re super smart, boasting the most PhDs per capita in the nation and ranking in Forbes’ Top 25 Most Educated Cities in America. Huntsville has an aerospace sector that’s quite literally out of this world, sending man to the moon with NASA’s Marshall Space Flight Center and teaching kids fundamental skills through simulations at the US Space and Rocket Center’s world-renowned Space Camp (don’t worry, Captain Bane, there’s an adult Space Camp too). We hold the nation’s military missile defense sector at Huntsville’s Redstone Arsenal and also have the second largest research park in the nation, Cummings Research Park, which is home to over 300 companies in the aerospace, defense, engineering, biotechnology, software development, manufacturing and IT industries. So yeah, we’re pretty smart. And not only are we smart but we’re cool too, coming in hot at number 16 on Insider’s Top 20 hippest cities in the U.S. everyone under 30 wants to move to. We have a former high school that was transformed into an axe throwing, beer brewing entertainment center; a vintage cotton mill from the 1900s that is now the largest privately owned arts facility in the U.S.; extraordinary coffee shops, restaurants, local businesses, and a drive-thru zoo (yes, you read that correctly). And to top it off, US News just ranked Huntsville #7 on their 2018 Best Places to Live list. Huntsville is on the rise with commercial growth. Jeff Bezos, Facebook, and Toyota-Mazda have all anchored in Huntsville, and we’re anxiously awaiting for Trader Joe’s to dock here too. All of Huntsville’s treasures lie within spitting distance of MidCity Huntsville, the fourth largest commercial development in the nation. You could be neighbors with Topgolf, High Point Climbing & Fitness, Dave & Buster’s, a world-class amphitheater and performing arts center, 900 multi-family residential units, and so much more. 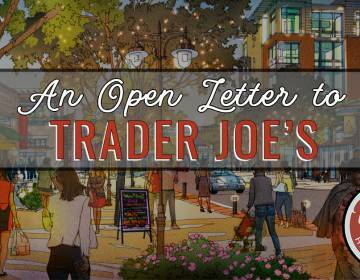 Trader Joe’s has the perfect home at MidCity, and our community agrees. So this is an open letter to you, Captain Bane, and your outstanding Trader Joe’s Crew to set sail to Huntsville, the star of Alabama, and anchor down at MidCity. We’ll take care of the mini lobster here.